As sensing, computing and communications systems change the way our cars operate and interact with us, Ford engineers are looking towards the next wave of automotive electronics innovations that will continue this trend towards the further digitization of our vehicles. Chief Technology Officer Paul Mascarenas at Ford is leading the Blue Oval's charge in driver assistance and mobile device connectivity. 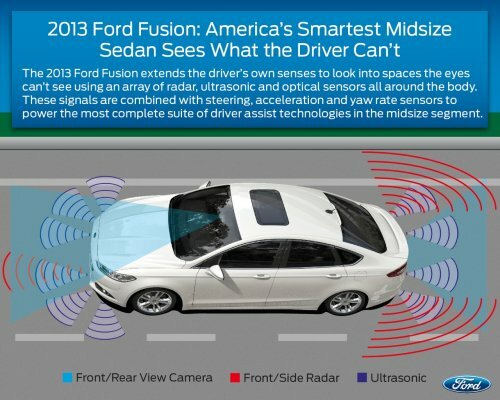 The 2013 Ford Fusion, he points out, has more than 145 actuators, 4,716 signals, and 74 sensors to monitor the perimeter around the car as well as the car's functions and driver responses. These sensors produce more than 25 gigabytes of data hourly and more than 70 on-board computers analyze it in real-time. Using all of this data in useful ways is what Ford is working towards next. Managing "Big Data" is one of today's common information technology challenges. In fields outside of automotive, Big Data is a common issue with companies like Amazon, Google, and others tackling it with various techniques, often involving cloud computing - spreading data over clustered networks of computers so they can not only work together, but act as mutual backups as well. One of Ford's focuses in this regard is the seamless integration of data across cloud ecosystems using Ford SYNC and similar technologies. This, Ford believes, will allow them to take connectivity in the vehicle to a new level as more and more people use the cloud to store their data. From iTunes music boxes to Google services, connecting to things will become easier in the near future. Adding to this, Ford engineers are looking at how all of the data the car itself generates can be utilized to make driving safer and easier. One way is to use the data the car's external sensors (radar, sonar, etc) as well as the data other cars in the area are generating (all synched via the cloud) to anticipate traffic and potential distractions on the road and then minimize in-car distractions (phone calls, radio tuning) in order to keep the driver's attention on the road. Machine learning, such as that used in the new C-MAX plug-in to maximize electric driving, can be spread to other uses in and around the car, further tuning the vehicle to not only the driver's style and needs, but also toward environmental stewardship.